Investors these days are obsessing over when the Federal Reserve will start raising short-term interest rates. Drawing less scrutiny is where rates will end up in the long run and how they’ll get there. But it’s time to start paying attention. Fed officials have made clear they expect to begin raising short-term interest rates from near-zero this year, though not before midyear. After that, there is great uncertainty at the central bank and in the markets about the future path of interest rates. The long-run outlook for rates has consequences for everyone. For households, it will determine payments on mortgages and car loans; for businesses, on corporate bonds; and for the government, on the$13 trillion in debt held by the public. A disconnect between the Fed and the market over the long-run rate outlook also could be a source of market turbulence in the months ahead. Central-bank policy makers on average see rates going nearly twice as high as futures markets indicate in coming years, for a variety of reasons. If the Fed is wrong, it might make a mistake on interest rates that jars the economy. If the market is wrong, it might be setting itself up for a tumble if rates go higher than expected. The Fed’s latest forecasts show that nine of 17 policy makers see the central bank’s benchmark interest rate—the federal funds rate—at 1.13% or higher by year-end. The median estimates—meaning half are above and half below—reach 2.5% for the end of 2016 and 3.63% for the end of 2017. On the other hand, in fed funds futures markets, where traders buy and sell contracts based on expected rates, the expected fed funds rate is 0.50% on average in December 2015, 1.35% in December 2016 and 1.84% in December 2017. One reason for the disparity: Futures prices reflect investors’ calculations that there is some probability rates will return to near-zero after a few increases and stay there. This happened in Sweden after its central bank raised rates in 2010 and in Japan after 2006. In both cases, the central banks had to reverse course and cut rates after economic shocks and deflation pressures crippled their economies. A survey by the New York Fed of Wall Street bond dealers in January showed they attached a 20% probability to U.S. short-term rates returning to zero within two years after liftoff. A return to zero isn’t the Fed’s expected outcome, so it doesn’t show up in its rate forecasts. Investors might have other doubts about the Fed—that it won’t reach its 2% inflation target and will thus be forced to keep rates low, or that it won’t have the will to carry through on the rate increases it has telegraphed. The longer-run rate outlook was the center of discussion Friday at a monetary-policy conference sponsored by the University of Chicago Booth School of Business. 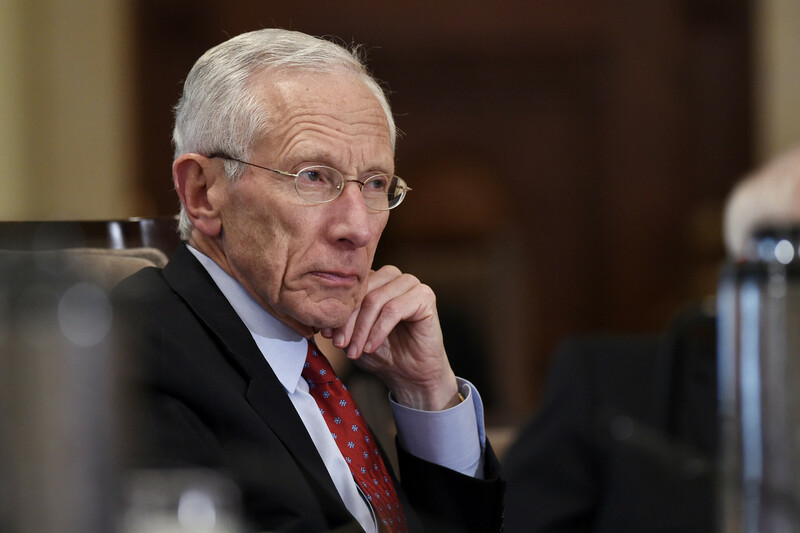 Fed Vice Chairman Stanley Fischer said there that market expectations might move—perhaps abruptly—closer to the Fed’s when the central bank starts lifting rates. A first increase “will add to the credibility of what we’re saying,” he said in a not-so-subtle warning to investors who doubt the Fed’s plans. In theory, there is a long-run equilibrium interest rate where the Fed is headed which, as with Goldilocks and her fabled porridge, would leave the economy neither too hot nor too cold. That is, this rate is not so low that it causes inflation to surge but not so high that it holds back growth. It is also the rate that balances investment and saving. In a period when businesses are reluctant to invest, or when savers are piling money away, the rate is likely to be low. Fed officials estimate this long-run rate is now around 3.75%, which amounts to 2 percentage points as compensation for inflation and a 1.75-percentage-point real return on investment. Their forecasts suggest they effectively see themselves getting close to this equilibrium rate by the end of 2017. Lawrence Summers , Harvard University economics professor, has posited that the equilibrium rate is lower now than in the past because the economy is growing so slowly and real returns have fallen. Fed officials have nudged their estimate down from 4.25% in 2012. Many investors have doubts about the Fed’s forecasts. Meanwhile, many economists and Fed officials don’t see eye to eye with Mr. Summers on his theory that a new era of “secular stagnation” in the economy has substantially lowered the equilibrium interest rate. “We are skeptical of the secular stagnation view,” concluded a paper presented at the Booth conference. Like many Fed officials, the authors— James Hamilton of the University of California, San Diego; Ethan Harris of Bank of America ; Jan Hatzius of Goldman Sachs and Kenneth West of the University of Wisconsin—concluded the economy has been held back by temporary headwinds and not a permanent reduction in its potential growth rate. Given all the uncertainties about growth and inflation, Fed officials will have to feel around for the right long-run interest rate like a person in the dark. “I don’t think that is a question we can answer right now,” Mr. Fischer said of the long-run rate. The uncertainty means an important change in central-bank tactics is coming. For a decade now, Fed officials have used various ways to give investors “forward guidance” about where interest rates are going. In their latest guidance, Fed officials said they would be “patient” before starting to raise rates, meaning no rate increase is likely at their next two policy meetings. They are now moving away from this guidance. It appears investors are going to find themselves doing a lot of guesswork about the path of rates after they start rising this year, along with the Fed itself. Posted on March 2, 2015, in Postings. Bookmark the permalink. Leave a comment.